Jerusalem (Agenzia Fides) - The dozens of deaths and about 3 thousand people wounded during the Palestinian protests organized at the border fence between the Gaza Strip and Israel could have been avoided "if non-lethal tools had been used by the Israeli forces". 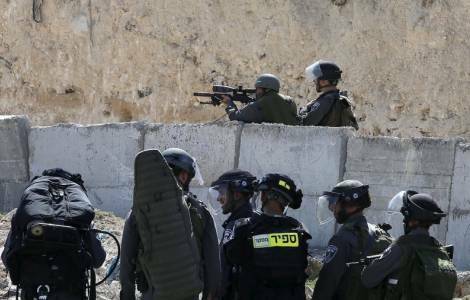 The Catholic Bishops of the Holy Land are pointing their finger at the Israeli army, who yesterday, Tuesday, May 15, issued a statement about the tragic events that bring bloodshed to the land where Jesus Christ was born, died and resurrected. In their message, released through the official channels of the Latin Patriarchate of Jerusalem and also sent to Agenzia Fides, the Ordinary Catholic Bishops' Assembly of the Holy Land calls to end the siege imposed on about two million Palestinians in Gaza Strip as soon as possible. The Catholic Bishops add that the relocation of the US Embassy in the State of Israel from Tel Aviv to Jerusalem, like any other unilateral moves and decisions about the Holy City of Jerusalem, "does not contribute to advancing the long awaited peace between Israelis and Palestinians". And they also refer to the need, insistently referred to by the Holy See, to make Jerusalem "a city open to all peoples, the religious heart of the three monotheistic religions", avoiding unilateral measures that could alter the profile of the Holy City. "We believe", say the Catholic Bishops of the Holy Land, "that there is no reason that could prevent the City from being the capital of Israel and Palestine,", adding that this should be done through "negotiation and mutual respect". The Assembly of ordinary Catholic Bishops of the Holy Land gathers all the Bishops of the Catholic Churches - Latin, Greek Melkite, Armenian, Maronite, Chaldean and Syrian Catholic - present in that region, together with the Franciscan Custodian of the Holy Land. On Tuesday, May 15, Archbishop Pierbattista Pizzaballa, Apostolic Administrator of the Latin Patriarchate of Jerusalem, also invited "all priests, religious men and women, seminarians, all the faithful of Jerusalem and those who wish "to take part in the prayer vigil for peace that will be celebrated in the afternoon of next Saturday, on the eve of Pentecost, in the church of Sant'Etienne.